The Papua New Guinea Opposition has call for a change in Government for Papua New Guinea’s long-term national interest. They warn of more serious socio-economic problems if the current regime is allowed to continue in office. 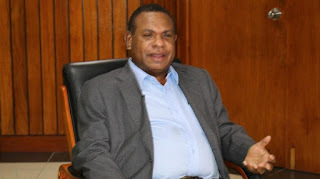 Leader of the Opposition, Patrick Pruaitch, warned that if the current political leadership in not changed, PNG will sink deeper into more serious problems than ever experienced before. Pruaitch warned that the current unprecedented level of corruption, financial and economic mismanagement is far worst that than the problems created by the former PNC Government under the late Bill Skate’s leadership from 1997 to 1999. “Unless we change this government the problems we’re facing will worsen to far reaching levels which will take many years to fix,” he stressed. Pruaitch said: “We need a change in government to start fixing the problems created by the PNC-led Government in the past nine years”. “Government that the current opposition is part of will initiate and implement changes to spend money differently, including adjusting expenditure levels and live within our mean. “We can’t continue to borrow huge amounts of money and spend what we do not have. The Government has misled the nation on many issues including the fake 2018 national budget that has many flaws. There must be a change in Government so that the new leadership takes appropriate remedial and economic recovery measures,” Pruaitch stressed. He said the PNC-led Government of Peter O’Neill is repeating the same mistakes of the Bill Skate government in late 1990s. Between 1997 - 1999, under the leadership of the late Bill Skate, the PNC Government ran down the country with the PNG kina reaching all time low at one PNG kina was worth a mere US 28 cents. Foreign exchange reserves had dwindled to less than one week’s general import cover and the currency was facing inconvertibility. As well, in the two years after the 1997 election, inflation rose from 4 to 22%; interest on Treasury bills shot from 9 to 28%; foreign exchange reserves fell from US$535 million to US$89 million; and the US$ exchange rate for 1 Kina plummeted from 71 to 28 cents. However, things stated improving when that PNC Government was ousted with Sir Mekere Morauta as Prime Ministers from 1999-2002, which saw major reforms in all sectors rescuing the country from total collapse. The National Alliance came into office after the 2002 general election continued until Peter O’Neill became Prime Minister in 2011 and again after the 2012 and 2017 elections.